A Blue’s Clothing was established in 2009. A professionally well managed running organisation by two young entrepreneurs – who have more experience in textile industry i.e fibre to fashion In both knits and woven. Established with single manufacturing unit in Tirupur at 2009.Today ABLUESCLOTHING has emerged as multi product manufacturing organisation for many of the European customers with good quality and competitive prices.As our factory has attained the Government of India Recognised Star export House status in 2011. The firm is 100% Export oriented, it produces a wide range of knitted and woven garments especially for Women’s, Men's & Children’s Wear. The Company’s Export Network includes UK, Belgium, Germany, Switzerland , Austria and Italy. Is fully equipped right from the Knitting to finishing of Garments and the Production volume is around 60,000 (Basic) Garments / Month. 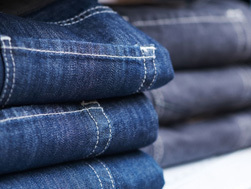 Consistent Quality, impeccable finish and attractive designs mark every garment that comes out from with A Blue's Clothing a very competitive price. Our products have gained widespread recognition and acceptance from international customers in Europe and UK . With the tidy work dividing system of process segregated in several departments for Sampling, Merchandising, Production, Quality Control, Shipping, Banking, Finance and Communication to ensure prompt service at all times to keep customer friendly. A Blue’s Clothing is upgrading its fashion technology time to time, aimed at those who prefer something more classical. This means being in constant touch with fashion trends and technology worldwide. @ 2014 ABC. All right reserved.